that disclosing, copying, distributing or taking any action in reliance on the contents of this information is strictly prohibited. Thanks! desktop-switcher isn't putting "panel" in the required components list, which causes this issue. I'm working on a fix for this now. Okay, so I think I've fixed this and attached a new version of desktop-switcher for testing purposes. After restarting, you should now have your panel loaded properly. and then start desktop-switcher as normal, switch modes, and hopefully you should always be left with the correct set-up.! It may also help if you delete the ~/.confg/desktop-switcher folder, which may have a corrupted panel config in it. Hopefully this should fix the problem for you! sure a logical solution will prevail !!! I think that happened because your config became corrupt with the previous issues. Could you try these debs again now that you have a clean gconf directory (be sure to remove ~/.config/desktop-switcher). > clean gconf directory (be sure to remove ~/.config/desktop-switcher). bug is not just Jaunty related! after the corruption mentioned in the bug. After reboot, the desktop was corrupted again, so ignore my last comment. I'm really confused and concerned about this bug. I can't reproduce it with the latest desktop-switcher, and I've been testing for over a week :-/. Rui, when you say "corrupted", do you mean that the gnome-panel configuration is screwed up? and reboot. This will restore all the panel gconf keys to the default settings, and hopefully fix your issue. If that doesn't work, then try moving .gconf and .gconfd somewhere (make sure you back them up first), and reboot. This means that your system will be have all the default settings, and although it's a pain, at least it will start to work again. To make it easier for me I had setup 2 accounts so I didn't mess up mine! please find the attached files for your review... thanks! Thanks for the log files Scott, it seems that the setting of the new required_components list get's screwed up in gconf. I have a new version of the switcher attached, could you please try that with a new test user and see if the same problem occurs? no output (?) I'll do some further investigation here me thinks! please find the attached file for hopefully some further insight! The error was from switching from classic back to netbook! 7. Once again, please run `desktop-switcher` in a terminal, and switch back to netbook-mode. Once again, please save the console output of desktop-switcher. 8. Log-out/log-in to the test user and please verify that the panels are still there. > 7. Once again, please run `desktop-switcher` in a terminal, and switch back to netbook-mode. Once again, please save the console output of desktop-switcher. > 8. Log-out/log-in to the test user and please verify that the panels are still there. > ** Attachment added: "desktop-switcher_0.4.4-1ubuntu2_i386.deb"
He he I have an itchy send button! however, the launchers are present when desktop-switcher is used again! and then were present after logout/login (?) mabe just a one off? I installed Ubuntu 9.04 NBR on my Asus Eee PC 701 yesterday and switched to Classic Desktop, as Netbook Desktop has painfully slow response. Rebooted and now I am left with just a background and no panel. Could someone please advise on either how to apply this fix or at least how to switch back to Netbook Desktop? The problem is that because I don't have panel, I have no idea on how to apply this. then you can reset back to the netbook default. should get you back to a usable system! > to Classic Desktop, as Netbook Desktop has painfully slow response. > panel, I have no idea on how to apply this. Thanks for the reply Scott. What is the consequences of deleting .config .gconfd? desktop-switcher_0.4.4-1ubuntu2_i386.deb prior to trying to switch works. > then you can reset back to the netbook default. > should get you back to a usable system! Neil Is there any further information your require for this or do you have all that you need? Scott, could you just confirm whether the last switcher build here works for you when switching between modes, and your panels/windows are present after log-out/log-in? At present (June 23/2009) On a ASUS 9 Netbook, I have my Ubu 9.04 completely up-to-date- all upgrades have been applied. If I open it in the "netbook" menu mode, and then switch to "Classic, it is OK.
the desktop will come up with no top or bottom menus. But, my changed wallpaper is OK. And desktop icons, including terminal and desktop-switcher that I have added, are available,. -On the desktop, I have conveniently added a 'desktop-switcher" icon. - I Use the switch desktop (I have added it to my favorites) and then switch back to "classic" mode. It is annoying, but it works. When, WHEN is a fix for this feshlugginer bug gonna be forthcoming?? I just ran into this bug also. 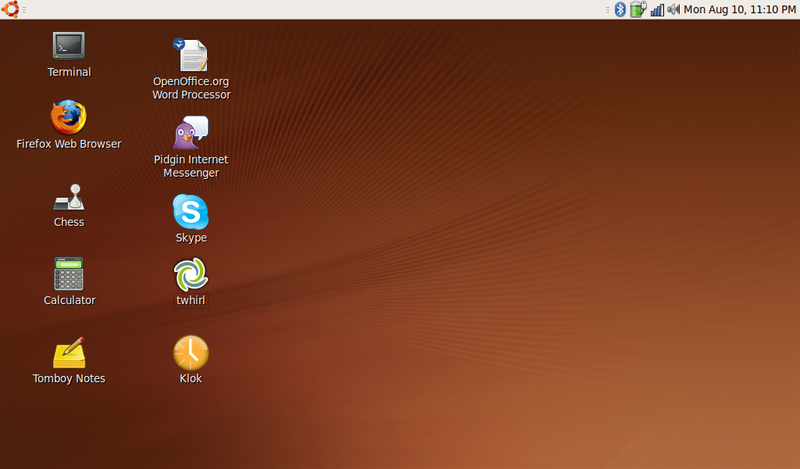 Fresh install of ubuntu-9.04-netbook-remix-i386.img on my Asus EEE 1000HA and applied all updates. Then I switched over to Classic mode and rebooted. Panels were gone. Alt+F2 doesn't work so I had to make a desktop shortcut to gnome-terminal to do stuff (including launching gnome-panel). I hope it gets fixed soon.. it has been a while and it has probably annoyed other people more than it has annoyed me. The attached file "desktop-switcher_0.4.4-1ubuntu2_i386.deb" worked for me on my Dell Latitude C640. Thanks! The Netbook Remix desktop did not work to my liking at all. I searched for some time for a solution. Thanks for all of your guys' help. Hi there. _0.4.6 seems to work for me (eeePC 900, using 9.04), but I had to switch back and forth once betweent the two modes to get it right. After much confusion, I have everything back to normal, aside from one small issue. After installing the desktop-switcher 0.4.6.deb, I have the problem of UNR interface going down sporadically. I noticed that i am running the i686 platform and the desktop switcher .deb is configured for a i386 platform. Could this be the cause of the aforementioned issue? I have had to alt+F1 to access applications. Additionally, I have noticed that as the UNR interface goes down, it is caused by the desktop switcher permitting the system to switch back into desktop mode. When I use the switcher to switch back to UNR, I am able to use everything, and normality is restored until it switches back... However I do get the same error message as rdsherwood and cowboy above. 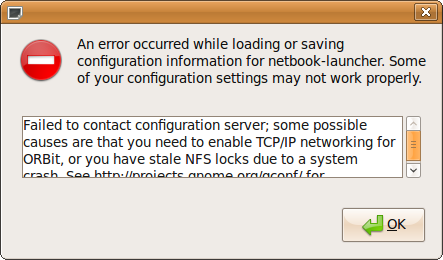 "An error occurred while loading or saving configuration information for netbook-launcher. Some of your configuration settings may not work properly" and under Details it says "Failed to contact configuration server; some possible causes are that you need to enale TCP/IP networking for ORBit, or you have stale NFS locks...". Since my previous posts, i have learned that my home partition does display correctly in the UNR mode and upon mousing over it, the system automatically switches to desktop mode without windows panels. Any help with the issue? I feel reasonably certain that i have not encountered this bug until yesterday, when several installs resulted the same way: switching to standard mode from netbook, and upon reboot, I lose both top and bottom panels and can only right click on the desktop. As such, I cannot even open a console, let alone get to a menu. The problem is consistent: at one install I switched desktop mode *before* installing any updates, and another time, I did the switch after the most recent updates [06 AUG 09] were received from the channel and installed. how soon may one reasonably expect a fix to be in the updates channel? changed to normal desktop - restart - no panel desktop - right click create new folder - go to folder - search in 'file system' for UNR launcher (sorry i dont remind the path) - change to UNR desktop - go to synaptic 'unmark' UNR desktop or launcher - restart - no desktop panel - go to folder - go to /usr/share/applications - open "Panel" (icon with small arrow and foot print) - restart - everything is very fine ..
What is the name of the UNR launcher executable? I re-installed the (defualt) Xandros distro, and I was thinking of installing either EEEbuntu or Easy Peasy, but since both of these are based on ubuntu, I suspect that the problem might exist across these variations of the distro. This is very strange. I had printed up your suggestions, and was about to follow the directions. Guess what? I had NO NEED to do so. 1) I had re-installed the [ASUS] Xandros distro, after reading your post, I did a CLEAN install of Jaunty 9.40 NBR from my SD card. 2) Once the system initially booted, I went to my system preferences and switched to desktop mode. 3) Select "REBOOT" and stepped away from the machine to read the rest of my emails on my Macintosh. To my surprise I went back to the Asus and found that I had the standard desktop. To VERIFY, I selected reboot again. sat and *watched* the machine, and it came up again _as it should_: NO MISSING PANELS or menus. /REM: This was done before installing any additional applications, or downloading the latest updates. Code on the machine is the default from the NBR image file as provided from Ubuntu. / REM: I *know* that I had previously installed / re-installed the 9.10 NBR a couple of times, and each time I was able to switch desktop modes without Bug 349519 ever rearing its ugly head on my Asus. /REM: The only difference in past installs was that _THIS TIME_ I had initially installed Jaunty 9.10 NBR _without_ a SWAP partition. !!! This was the only (and first) time that I encountered Bug 349519 on my Asus EEE 1000 PC. !!! Previous installs never exhibited this problem, even after constant upgrades from the update channel, or installation of third party applications ... including the bug fix for Pidgin (bug: not connecting to Yahoo). AFAIK, this problem only happens if you shutdown/restart whilst in "Classic" mode. I have a workaround as posted - it has worked on all three of my Ubuntu 9.04 eee netbooks. When clicked, it will invoke the desktop-switcher routine. If before re-booting, you have forgotten to switch the desktop from classic back to the "netbook" mode, the screen after rebooting will have no top or bottom trays! 2. Use the switch desktop (I have added it to my favorites) to switch back to "classic" mode. Classic is then OK! i.e. it has the top and bottom trays. If you switch BACK to Netbook desktop before you do a re-start/shutdown all the above machinations need not be performed. First of all, I did the switch to "Classic" *AND* rebooted _without_ switching back. I DO have the default launchers at the top and bottom of the screen. HOWEVER: I do not get any icons on the desktop when I mount my drives (fixed partitions, USB stick(s), SD card, or external DVD/ CD writer. e.g. I used to have a picture on the desktop. *Now*, if I go to Places => Home => Pictures, I can copy and paste the photo to the "Places" Desktop. The photo / icon shows up in the file browser (desktop) but when I actually go to the desktop itself, the photo icon does not show up! also, I have already done a packages update, and desktop-switcher_0.4.6_i386.deb, apparently did not come down with the latest updates. I guess I'll have to google it, manually install the package / version that you suggest, and report back. Generally you are recommended to install the version from the software channel, since it is usually better supported." so it's clear that this is not yet on canonical, correct? !! Thank you for the pointer to the newer package. !! At each click of the mouse the dialog would minimize to the upper LEFT of the screen, and then jump back. During this time the contents of the dialog were not legible, as part of the screen turned black. After a few tries I was finally able to select "classic" *THEN* find the "OK" button. some more flickering, and then I finally got back my desktop, this time INCLUDING icons of objects on the desktop and the mounted drives. /REM I wonder if the refresh rate had anything to to with this. BEFORE installing the update, I had changed the display in my Asus EEE 1000 from 1024 x 600, 60 Hz (default) to 65 Hz. Hopefully the newer package will be added to the updates channel to facilitate newer users. it is late Friday night; I have consumed copious amounts of wine, and alas, am all alone. So I appear to be prisoner to your miserable bleatings. AFAIK the fix (0.4.6) as posted by Neil J. Patel back in June seems to work, after a fashion. I would STRONGLY suggest that you convert to classic mode and STAY there, if.. IF you have applied the above 0.4.6. The cursor, in Netbook mode, is still extremely jumpy. Who knows why? My "classic" mode now looks,and more importantly, operates just like my desktop Ubuntu 9.04 systems. That's all I want. These Mini-PC eee modes be damned! And at this time of night, I have no intention of trying to debug the XML .. LOL! newbies. I prefer to err on the side of "excess detail". sincere apologies.... I wish you a vey good weekend. wiith cordial and RESPECTFUL greetings from Montreal, Canada. THANK YOU for your help. End of discussion. > alas, am all alone. > So I appear to be prisoner to your miserable bleatings. > Let's take this off-line. > work, after a fashion. > if.. IF you have applied the above 0.4.6. > The cursor, in Netbook mode, is still extremely jumpy. Who knows why? 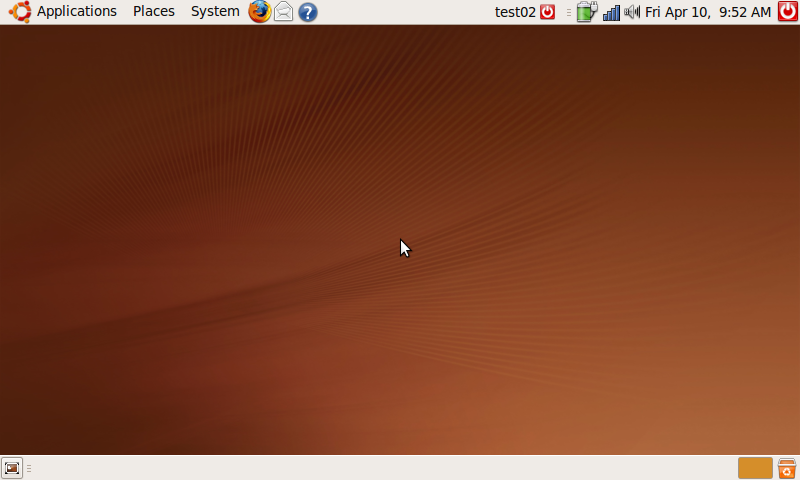 > desktop Ubuntu 9.04 systems. That's all I want. > These Mini-PC eee modes be damned! > Will advise you privately. "You only live ONCE: let's make life BETTER for each other." " Let's take this off-line." For the moment, Please use Neil Patel's 0.4.6 fix. It appears to work. And - stick to "Classic mode" ! I should know better to leave well enough alone: HOWEVER. old habits (as a beta tester) are hard to break. An error occurred while loading or saving configuration information for netbook-launcher. Some of your configuration settings may not work properly. /REM I wonder if this might relate to processor speed, since the intial reporte of this bug is using an Asus 900, whereas my machine is the newer Asus 1000. Hyperthreading is turned on by default in the BIOS. When I booted back, the netbook interface was available, WITH the classic was also visible in the background. I easily reverted to the classic look. Now, though the 'compiz' toolbar which looks like the OS/X toolbar is now on the desktop behind the bottom launcher. However, none of the icons in the 'compiz' toolbar work. I have in installed the fix and tried to follow everything. And there is no panel at the bottom and also no home button to access my programs.. I have added a screen shot of my current desktop in classic view. As you can see, there is no bottom panel, and at the top bar, the button at the top left corner doesn't do anything. So I cant access my applications. When I open a window/browser and minimize it, it goes on top panel. (Like NBR view). When I open terminal to switch back to the NBR using the desktop-switcher command -- i get the following errors --- but it does eventually take me to NBR view and everything works fine. My only problem is with the classic view..I just dont know why i cant have the old school classic view on my netbook, i definitely screwed up something which is causing this weird remix version of classic view (check screenshot). Any help to restore my original classic view would be gr8tly appreciated. saad@saad-netbook:~$ Cannot register the panel shell: there is already one running. > I have added a screen shot of my current desktop in classic view. > top panel. (Like NBR view). > ** Attachment added: "screen.png"
on other mailing lists, the directions to unsubscribe are generally or always in the message FOOTER. However, I notice that the method is different here. just above the list of subscribers, there is the "unsub" button. Hello. 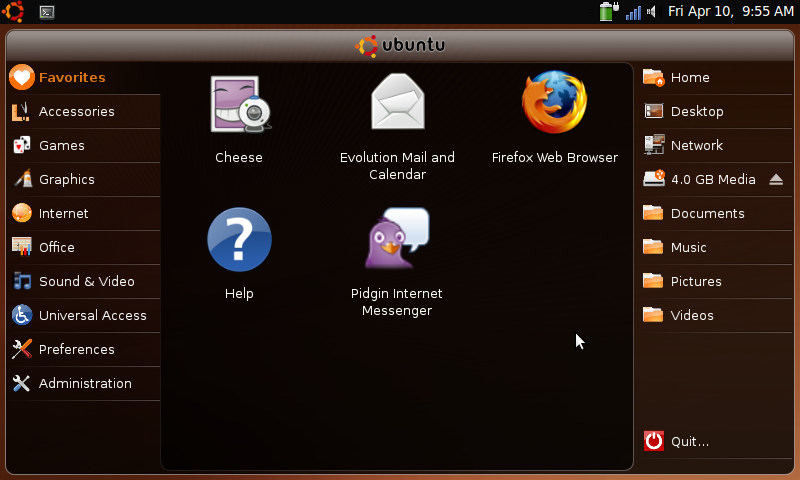 I am a newbie to Ubuntu & Linux. I am having the same problem as most in this forum. My problem is as follows: After a fresh install UNR on my Asus Eee Pc 901a, when i switch to classic desktop mode and reboot, I also lose all menu bars. When i switch back to Netbook Desktop, I have my desktop, but i do NOT have top menu bars and anything I launch is missing the "close (x)" button and most windows such as Firefox and other programs are not maximized. BUT, how do I do this. I am a beginner. Can somebody please give me step by step instructions on how to do this. Do I do this from the terminal? I really need step by step instructions from a pro. Thanks so much to everybody for your help. installed "GDebi Package Installer" from the Add/Remove Applications menu. Then down load to your desktop the patch. your desktop, it should default to open with the GDebi Installer). I think then, you can reboot and try the switch again and it should work. > Firefox and other programs are not maximized. > terminal? I really need step by step instructions from a pro. > Thanks so much to everybody for your help. Add a "Me too" with a 900 and a fully updated 9.04. Took installing desktop-switcher out of jaunty proposed, plus #142 info to set things right again. Thanks guys. Hopefully there'll be an upgrade in the standard fixes for Intrepid before Karmic gets released. Will test in Alpha5 though. I don't remember where I found this suggestion, but it worked for me. I want to confirm that 0.4.6 package seems to work for me. My users are using Dell Inspiron Mini 10v with Ubuntu UNR (I reinstalled it over the Dell-customized UNR), and had that desktop-switcher problem. When they came to me with their desktop stalled after trying to switch desktop mode, I just manually installed (dkpg -i) desktop-switcher_0.4.6, and entered 'gconftool-2 --set /desktop/gnome/session/required_components_list --type list --list-type=string ["windowmanager","panel","filemanager"]', and it's working fine. I've got UNR on a Dell Mini 9. The desktop switcher problem was resolved by just running 'gconftool-2 --set /desktop/gnome/session/required_components_list --type list --list-type=string ["windowmanager","panel"]'. Didn't even have to install the posted desktop-switcher deb. Rebooted a bunch of times switching back and forth between netbook and classic and no problems. Many thanks to Neil J. Patel for fixing this and to Scott Evans for reporting the bug. 2009-09-09 10:26:28 INFO 9 packages successfully removed. This thread has a lot of different commands suggested? I'm confused. I have a brand new laptop Benq U101P, with a brand new install of NBR. All I did was use the desktop switcher, whilst in the gnome desktop I added a workspace switcher to the top bar/menu and 3 workspaces. Then came back into the NBR desktop, (the workplace switcher was not there, so am using the function keys to switch workspaces). I then went back into the gnome desktop and removed the workspace switcher and put everything in the top bar/menu to the standard setup. Went back to the NBR desktop. At this stage the NBR top bar/menu is still there. I shutdown the netbook and restarted. BUG: No top bar/menu in NBR desktop. Tried switching to the gnome desktop and back again, does not fix bug. BUG: I get a very quick error window, that I don't have time to read ofter switching back to the NBR menu. Paste this command in the terminal press enter, then restart, to fix the Ubuntu Netbook Remix Desktop Switcher bug. Hey! I just tried a few commands in terminal and My netbook got fixed. Thanks! I fall in BUG #453933 that i later marked duplicate of this because I solved with the same command suggested above. The bad news is that there's a regression because I experienced it in 0.5.8 when i understand reading the comments above that 0.4.6 did soved it. which are duplicates of 390001. Maybe bug 390001 should be marked a duplicate of this bug? please don't change bug statuses without explanation. Window manager warning: meta_window_activate called by a pager with a 0 timestamp; the pager needs to be fixed.